Large organizations have vast resources – but this advantage inherently bears also a disadvantage: like large dinosaurs, with increasing size and maturity they lose the ability to adapt quickly to a changing environment as their smaller competitors can to seize business opportunities. Let’s first identify the three typical obstacles that large organizations struggle with before we address how to disrupt and overcome them as intrapreneurs. The task at hand is to spark new energy, employee engagement and business growth opportunities in alignment with business strategy and company culture. By the way, if you are new to intrapreneuring, see also The Rise of the Intrapreneur and the Top 10 posts for Intrapreneurs. Vertical Disconnect: Ideas from the bottom of the hierarchy do not find their way vertically to the top anymore to get implemented. Horizontal Divide: Functional silos separate the workforce horizontally which limits putting to effective action the full potential of the company’s resources and diversity in a concerted way. Inertia: More talking about change than taking action opens a widening gap between ideas and their implementation, as it is so much easier to lean back and improve incrementally than taking risks of major changes. Red-tape and ever mounting bureaucracy does its part to keep the wheels from turning and breeding a mindset of mediocrity. These obstacles combine to form an unfavorable ecosystem of stagnation by containing innovative thoughts from growing and ripening, by inhibiting innovators to take action with passion and by blocking courageous action necessary to drive the organization’s future success and –possibly- survival. Too often, “middle management” gets blames from keeping ideas and funds flowing more freely up and down the hierarchy (see also Leadership vs Management? What is wrong with middle management?). A mechanism is needed to pipe fresh and promising ideas in an appropriate format from the grass-roots to find their way to executives, where the ideas get recognized, sponsored and put into motion for the better of the company. This holds true for disruptive break-through ideas in particular and in contrast to the continuous incremental improvement (see also 10x vs 10% – Are you still ready for breakthrough innovation?) that typically makes up most of the organizations day work. Don’t be mistaken, executives worth their salt seek good ideas like the air they breathe. They are generally more open to necessary change and course corrections than one may think. The executives also hold the keys to feeding the ideas back into the machinery of the larger organization to get implemented. A mechanism is needed that allows cutting vertically through the red-tape and hierarchical boundaries of the mature organization. It creates a pipeline of ideas that connect the top with the bottom of the organization and everything in between with intrapreneurial passion. Large organizations tend to foster functional (and geographical) silos to increase efficiency, quality, and reliability in their operations (again, see Leadership vs Management? What is wrong with middle management?). This, however, effectively inhibits ideas of game-changing nature to flow freely and being developed with input from diverse perspectives to the benefit of the larger organization. A wise saying goes: “Innovation happens at the intersection of disciplines.” It is these diverse perspectives and adding brains to a problem that help to improve and develop an idea to become more robust, innovative and feasible. Thus, a mechanism is needed to effectively cut horizontally through organizational walls to allow employees to effectively collaborate, network and connect the established silos and islands. 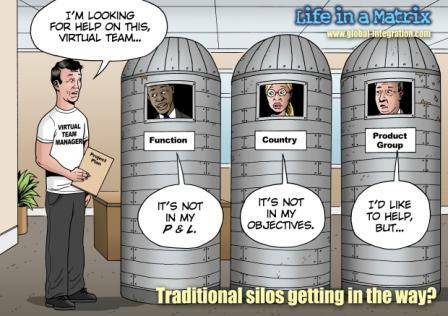 Are you stuck with organizational silos too? In the end, what we to achieve is giving good ideas a chance that otherwise would never get considered or implemented – especially in a mature business environment that favors low-risk incremental improvement over more risky breakthrough experimentation (see 10x vs 10% – Are you still ready for breakthrough innovation?). We need a mechanism that frees the intrapreneurial spirit of employees and directs the passion and potential of our employees’ ideas to tangible results that, ultimately, drive new business growth. Over the next blog posts I will address each of these approaches (and perhaps more) and share my experiences from implementing exactly that successfully in a FORTUNE Global 500 company. So, check back soon or get updates via Twitter @OrgChanger.